So, NeeNee likes to foray into Asian cooking on occasion. Sometimes it’s more traditional forms of Asian cuisine and sometimes it’s just a half-assed Americanized version of something somewhat resembling Asian food. I’ve made beef sukiyaki before with disastrous results (my grandmother ended up having severe chest pains after eating it because of the sheer saltiness of it). This time, I refined the recipe and succeeded in making the sukiyaki. It was quite good if I do say so myself. Although…I don’t think all the alcohol cooked off properly as it seems to have a bit of more of an alcohol undertone than when I made the really salty version the first time. Anywho, for those interested in making the Japanese dish sukiyaki (basically a braised beef dish), here is NeeNee’s recipe which is a moderation of the one found in Williams-Sonoma’s Food Made Fast Series. As you can guess, you just combine all the ingredients and set aside until you’re ready to use it. You need to soak the rice noodles in hot water for 15 minutes. Then rinse them in cold water and chop them into smaller pieces. Well…I at least rinse them in cold water and chop them into smaller pieces as they are usually crazily long. Heat the oil in a wok on high heat. Add the onion. Stir fry until tender. Add your mushrooms. Cook for about a minute before adding the shredded cabbage. Continue frying until the mushrooms are tender and the cabbage is starting to wilt (about 3-5 minutes). Next, reduce the heat to medium and take your prepared braising liquid and pour it over the vegetables. Bring to a low simmer (it’s fun watching the alcohol cook off if you’ve never seen it before). 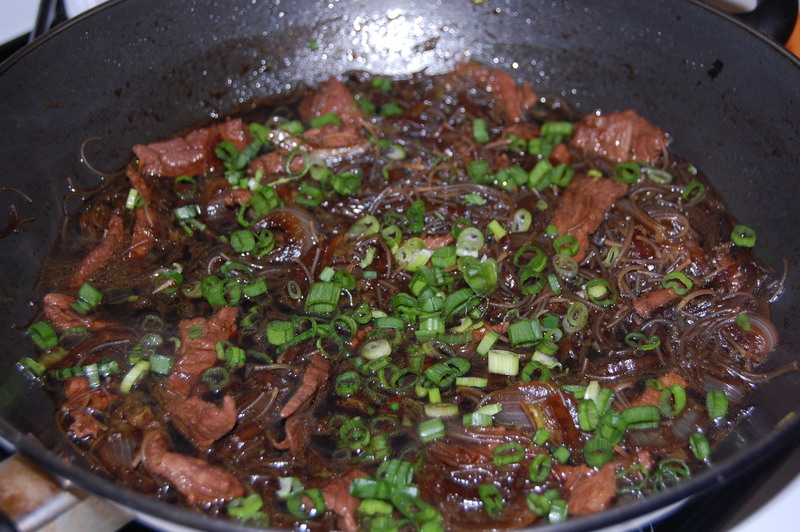 Stir in the noodles and beef, and simmer for about 3-5 minutes. You’re supposed to transfer this from the wok to a serving dish, I never do. Then top with the chopped spring onion. It’s yummy. Anywho, it’s slightly sweet and very yummy if you have the right kind of meat. I think next time, I might try adding some carrots or potatoes. Yum! That looks delicious and super-authentic! I think if I was making it I might use less alcohol though just to make sure it didn’t taste too alcohol-y. I love it in Japan where they give you the boiling broth and you cook everything yourself. Eating it with egg is good. Did you slice the beef thinly yourself? I can never find beef sliced to the proper thinness in American grocery stores although it’s sold pre-cut in Japan. Yay for looking authentic! This picture is actually my first overly salty attempt. This time I switched the water/soy sauce ratio and it was much better. You can request meat departments to slice the meat to the thinness you require, but I sliced it myself and did a pretty darned good job if I do day so myself. This looks great! With your clear steps, I might be able to make it successfully! Do you put this with rice or just eat it straight? Thank you for the recipe! Thanks! I am always afraid my instructions won’t be clear. Since I make this by using maifun (rice noodles), I haven’t personally ate this with regular rice, but I know other people do. Thanks! I am happy my 2nd attempt went better than my first. 😀 Now if only I could get my grandparents to actually “like” Asian food better 😛 I don’t make Asian food too often as my grandparents are more strictly meat and potato people. I know, I want to experiment with throwing whatever veggies I have in, too (like potatoes and carrots).